Explore our website and see why a visit to the Skyline Lodge would be a memorable experience for a quiet get-a-way, business conference, or an active family vacation. The Skyline Lodge has rooms with balconies, fireplaces, and wonderful views as well as private rental cabins that you won't want to leave. 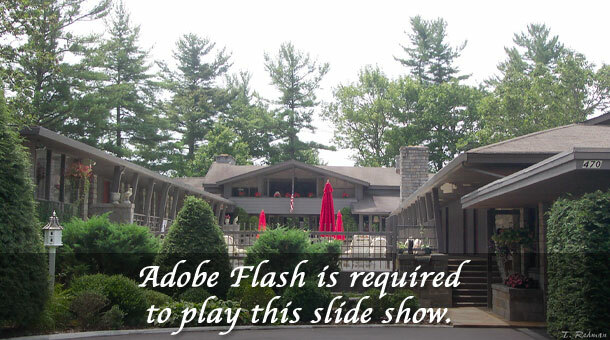 Our slideshow is a great way to get a feeling for the unique nature of the Skyline Lodge. Use the map at right to locate us, just outside of Highlands, North Carolina. Additional directions and location information can be found by clicking the "More" button below! Happy Holidays and a joyous New Year to all of our Skyline friends. We hope to make 2019 a memorable year whenever you choose to visit us! Book your room today! Skyline Lodge is truly unique in the variety of accomodations available. Rooms with balconies, fireplaces, pet rooms, and private cabins! Check out all of your options. The Highlands area in North Carolina is famous for its natural beauty but we also have great shops and activities for all. Read a bit about Highlands! Skyline Lodge is closed for Winter. We will open for the 2019 season on April 26th! Book your escape to the mountains in Highlands now! Current Rate Schedule * * * Book Online Now! The Skyline Lodge & Restaurant is located three miles from Highlands, North Carolina. Situated on top of Flat Mountain, 4,300 feet into the clear mountain air where the natural beauty of the Nantahala National Forest is but a short hike or drive from our main entrance. Fifty acres of old growth conifer and hardwood forest surrounds you at The Skyline Lodge. With a tranquil mill pond at our gate and the splash of a running waterfall below the balconies on one side and a view of the sunset in the mountains on the other, The Skyline Lodge features rooms with a view! Explore our website and see why a visit to the Skyline Lodge & Restaurant would be a memorable experience for a quiet get-a-way, business conference, or an active family vacation.